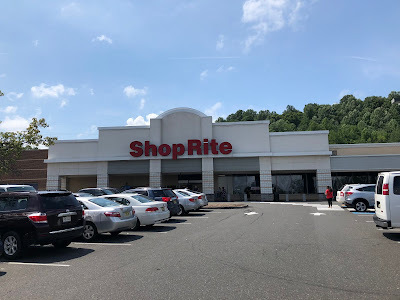 One more store tour in ShopRite week! 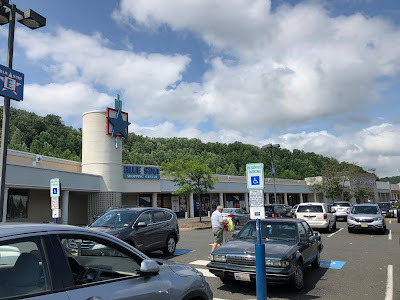 Today we're heading out to Watchung, a relatively small town located half an hour pretty much due west of Newark, for those who aren't familiar. 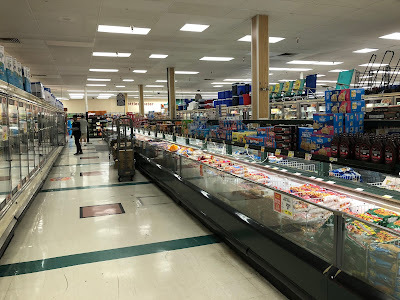 This ShopRite is owned by Springfield, NJ-based Village Super Market, whose stores we've seen in Garwood, Millburn, West Orange, and most recently, Livingston. 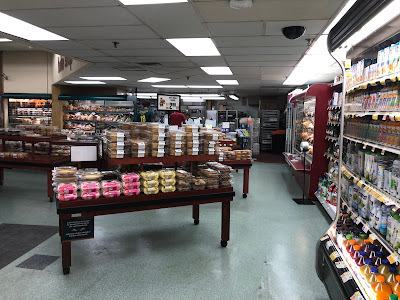 This store is in sore need of remodeling, given that its latest full renovation was probably in the late 1970s, although it has been kept up better than similarly old stores in Elizabeth, East Orange, and Millburn. 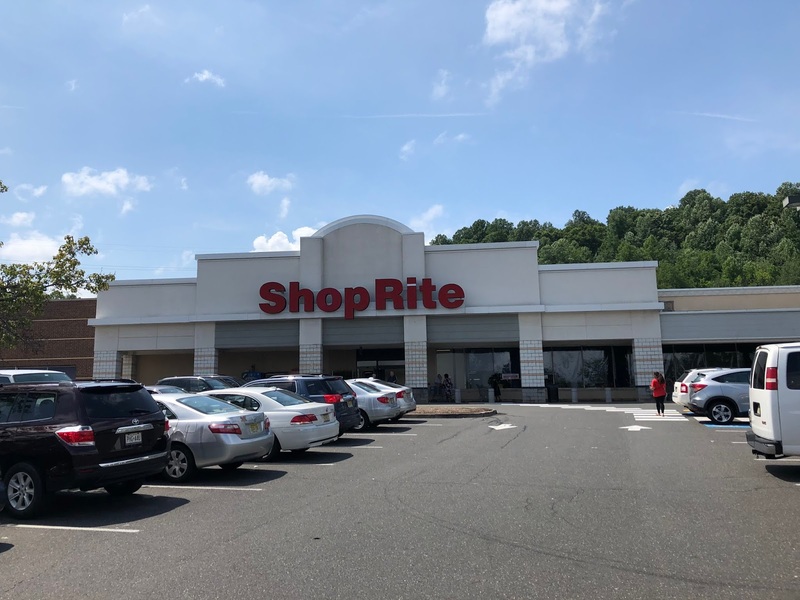 This ShopRite is part of the Blue Star Mall, a large shopping complex, and one of two major malls in Watchung. 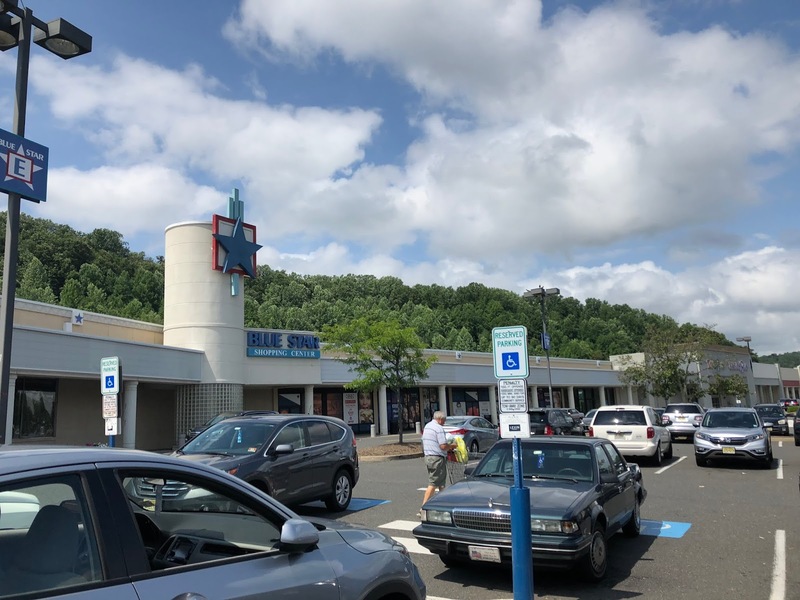 The other, Watchung Square Mall, includes a Stop & Shop as well as a Target and a Walmart. 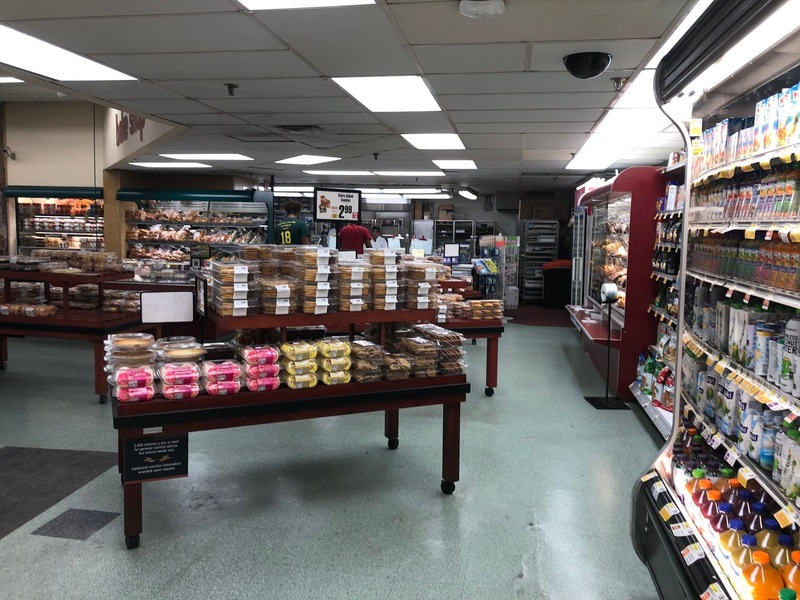 As per the usual Village layout, you enter to produce with bakery just next to the entrance, and deli and seafood along the side wall. 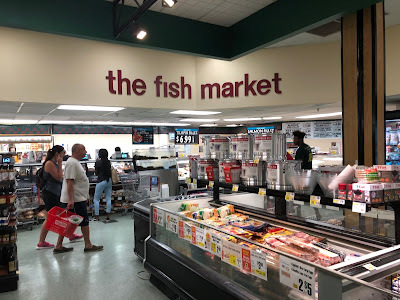 This store is flipped in comparison to a store like Elizabeth or East Orange, as its entrance is on the left side of the storefront. 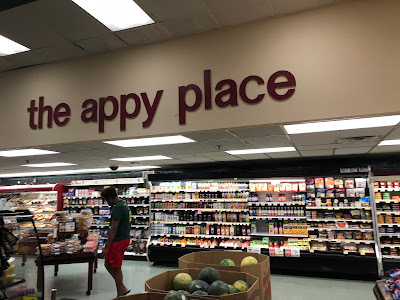 Insert groan here for "the appy place." 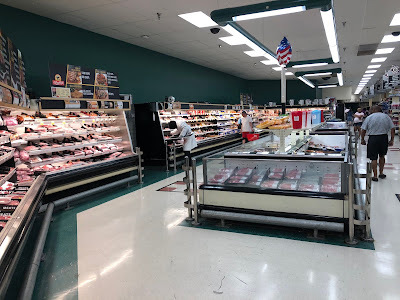 As we'll see, this store has been spared a "the meating place" sign at the meat department. 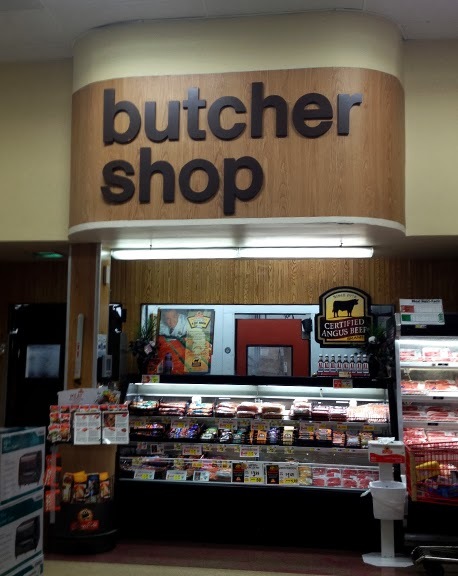 Strangely enough, the actual deli department has no sign. 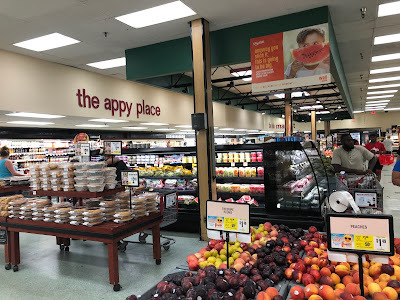 "The Appy Place" sign is over the packaged cold cuts section, to the left in the above picture. 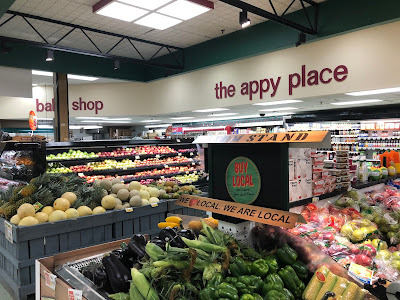 I do like the black structures over produce, which were presumably added later. My guess is this decor is from the late 1970s or early 80s, but was repainted with the color scheme of the decor we saw in Garwood and West Orange around 2005. 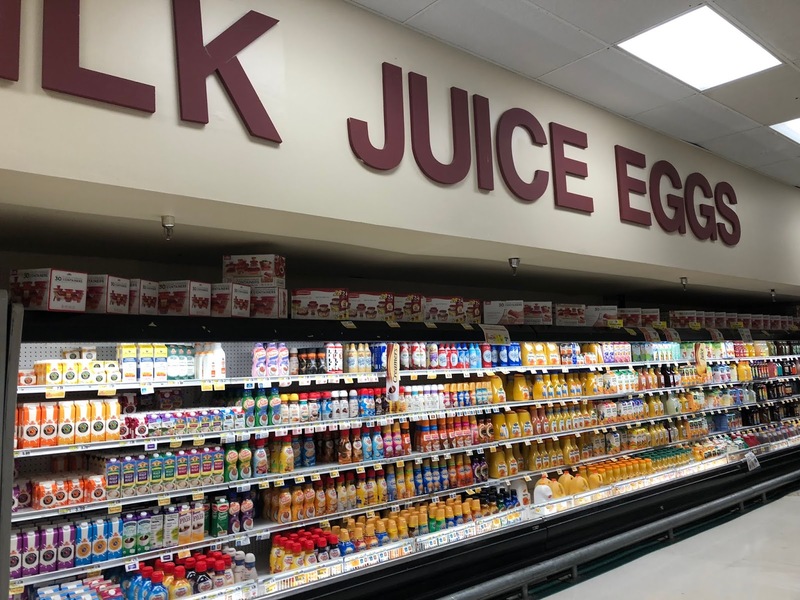 The beige, green, and maroon colors are exactly the same and the paint job looks much newer than the actual decor. 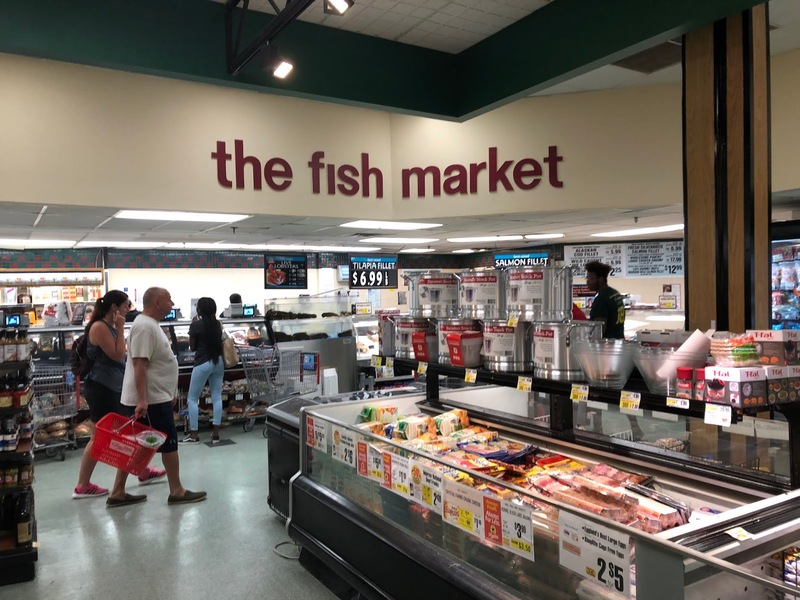 A service seafood department is located in the back corner of the grand aisle. Meat continues along the back wall of the store. Again, I'm thinking this green color on the walls was from a repaint around 2005, and I like the effect. 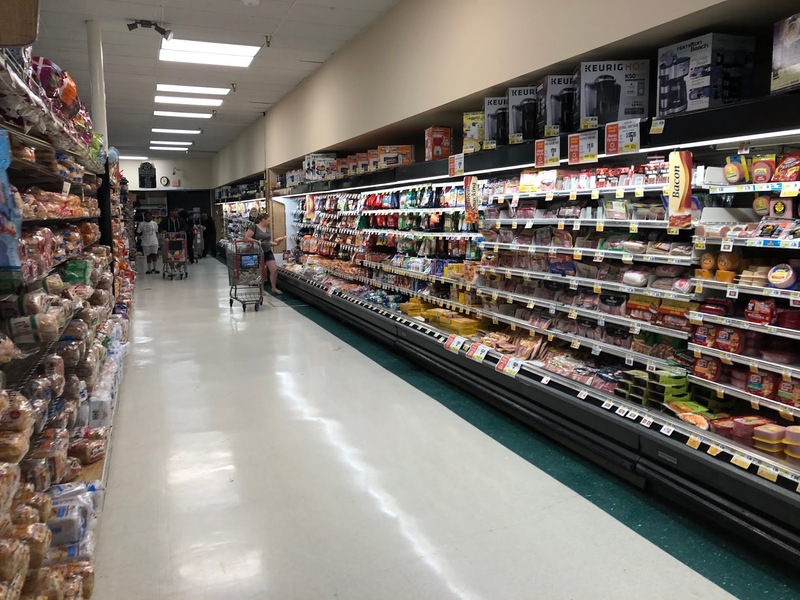 Beautiful, clean, wide aisles! No junk! 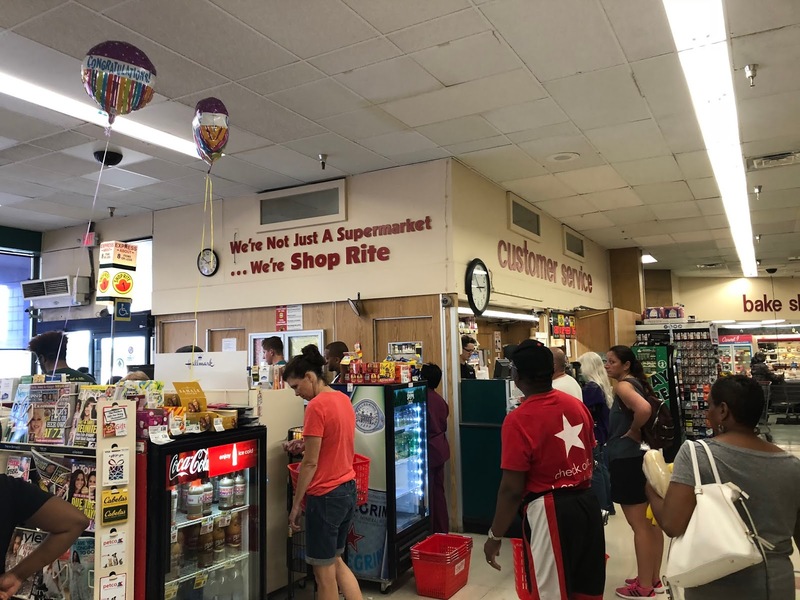 I'll also take a second to mention here that the aisle markers you see here are actually from the decor package of West Orange/Garwood. 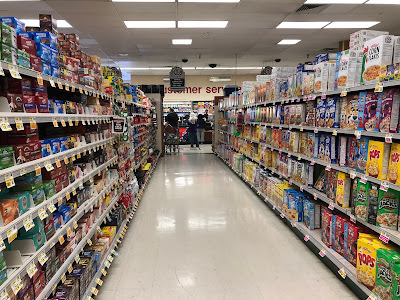 Previously, the store had generic red plastic aisle markers, which were replaced by (slightly) newer Village Market-styled aisle markers from the Morris Plains store when it closed. 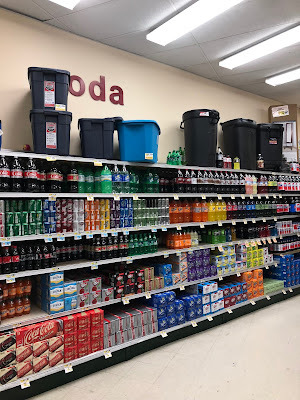 The current aisle markers are probably secondhand from Garwood or another nearby Village store when their aisle markers were replaced. In Garwood, the aisle markers have been replaced, but the decor has not. Why break up a decor package like that when you have perfectly good aisle markers? Dairy is in the back corner and continues along the side wall, with frozen on the far end of the store as well. 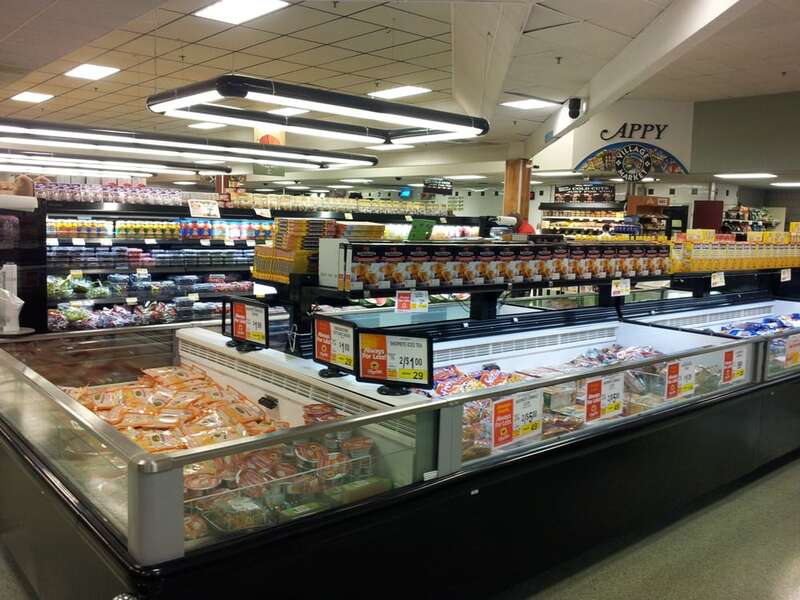 No freezer cases have been replaced in many years here, and the coffin cases are still running. I'm never a huge fan of coffin cases. The dairy cases in the last aisle are probably either newer or recently repainted. 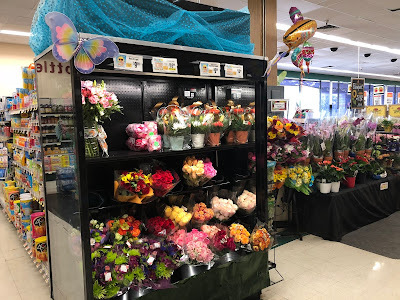 Heading up to the front corner of the store, there's a small corner where pharmacy usually is for soda and bottled water, and a small floral department. 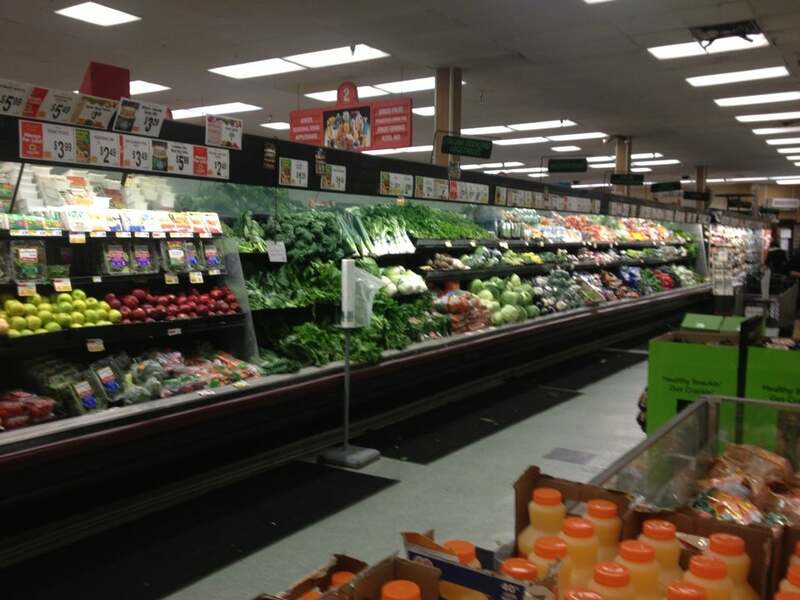 The checkouts are just to the right in the above picture. 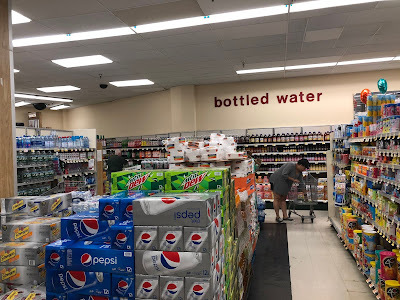 It's kind of a dead corner since there's not a lot of traffic through here; you only go to this corner if you need soda or water. Kind of a strange design. Here you can see soda to the left, floral in the center, and the front-end to the right. 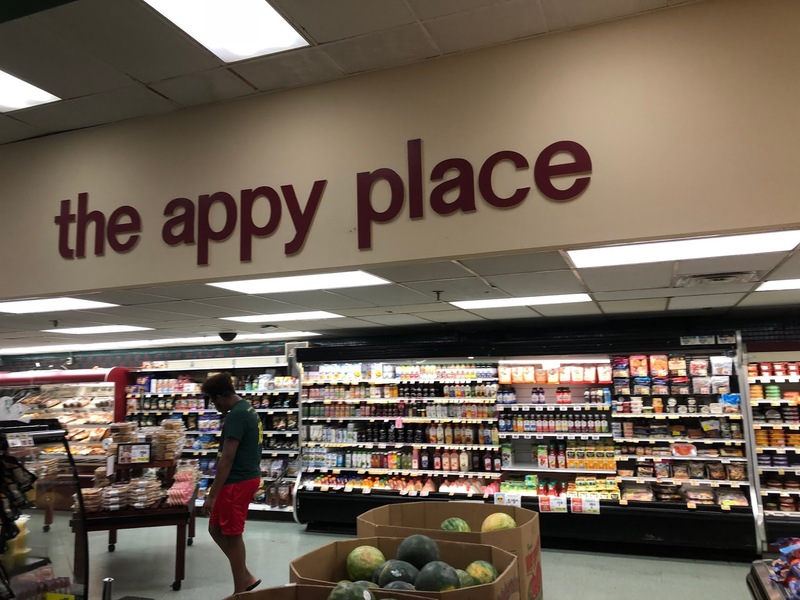 Customer service is on the far end of the front-end near the entrance. 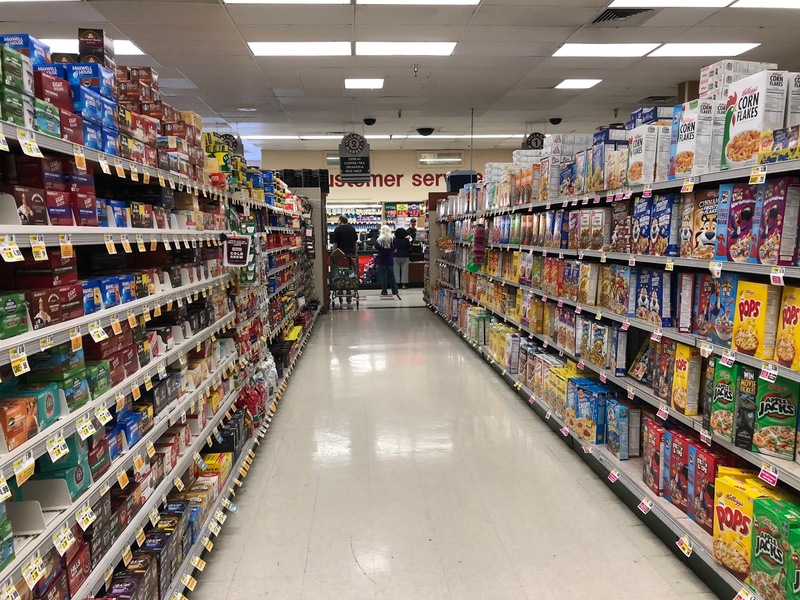 It's also the only example of this wood paneling in the store (at least, the only example I caught). Originally, I think there would have been more but it has been painted over or removed. 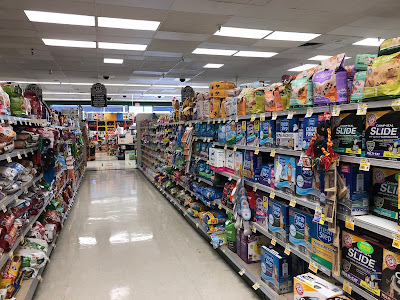 A look across the front end. The ceiling also needs to be replaced here, although the lighting is pretty new. All in all, it's not a bad store, it's just a little outdated. 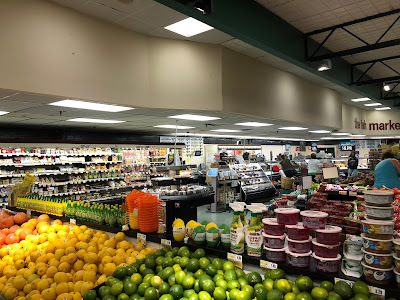 I'd appreciate a substantial renovation, but I'd settle for another repaint if they wanted to freshen up the store but couldn't invest a lot of money. I would imagine that rumor about the expansion is true, not least because that lease listing itself reads "reserved for proposed expansion" on the diagram of the complex. Hopefully that will come to fruition! Yeah, I was thinking the same thing. 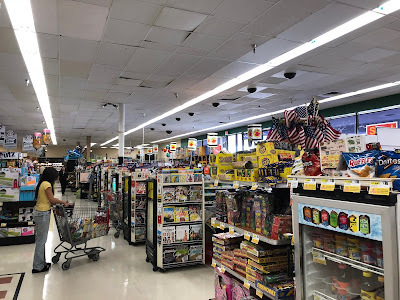 I do wonder if they're going to move over to the Toys R Us space so that it's not on the angle, though. I guess that would depend on how much they want to spend. If they're planning on getting all new fixtures throughout anyway, that certainly wouldn't be a bad idea! 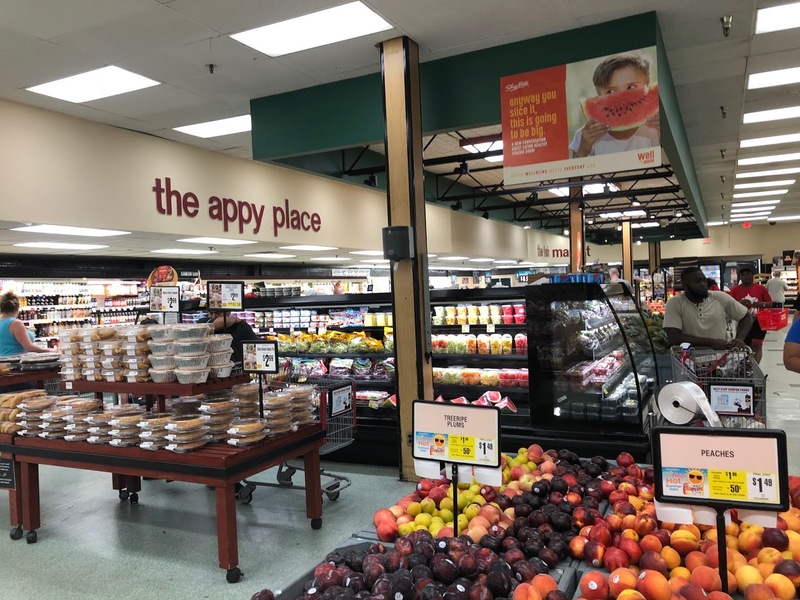 Would allow the existing store to remain open without any construction headaches, too - they could just have a smooth transition into the new spot once it becomes ready. 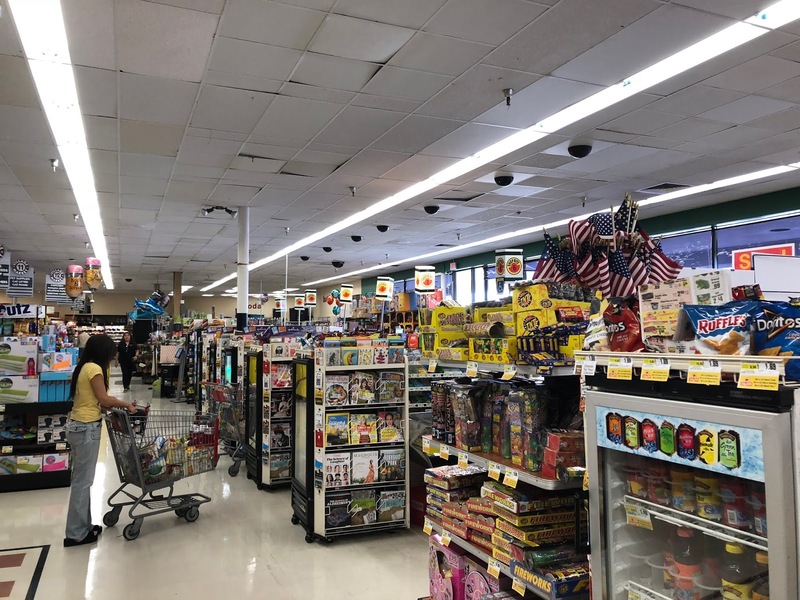 Which makes me think that, although this expansion has been rumored for years, maybe once it became clear (or likely) that TRU would close, they decided not to expand but to move and thus delayed the project a while.